Now Foods Vitamin D-3 is a dietary supplement containing 1000IU of cholecalciferol per capsule. Cholecalciferol – an organic chemical compound of D vitamins. Its main source is the synthesis of cholesterol in the skin under the influence of UV-B rays emitted at noon. It exhibits a hormonal effect by activating cholecalciferol-specific VDR receptors. It is a fat-soluble vitamin. The activation of the afore-mentioned VDR (vitamin D receptors) in osteoblasts can lead to an improved development of skeletal system structure. Vitamin D is undoubtedly essential for children’s normal development. There have been reports suggesting that increased vitamin D concentration in the blood of growing children can translate to their increased final height in adulthood. The primary application of cholecalciferol in children is also worth remembering, and that is reducing the risk of rickets. Vitamin D ensures more effective calcium uptake from the digestive system and its management in the organism. Vitamin D’s ability to stabilise blood calcium levels stems from its effect on parathyroid glands that produce parathormone which releases calcium from its storage places, mainly bones. Frequent colds are a factor that can effectively make life harder by preventing us from carrying out everyday duties and chores. A vitamin D supplement can be very helpful, as its higher levels mean greater immunity to colds. It proves particularly handy in spring and autumn. It is also important that it can modulate the activity of cytokines and markers of inflammation, such as IL-5 or TNF-alpha, thanks to which you get optimum proportion of pro-inflammatory to anti-inflammatory activity and greater stability of the immune system. Vitamin D levels in the system can be inversely proportional to sleep quality and well-being, and extremely low concentration may be linked even with an increased risk of symptoms of depression. Normal sleep plays a crucial role in the organism’s functioning. Supplementing D3 deficiencies can potentially improve sleep quality, regenerating the organism more efficiently after a day of activity and preparing it for facing the challenges of the next day. A protective effect on neurons has also been observed, thanks to which the nervous system can stay in good health for longer. As test results suggest, vitamin D3 can reduce the frequency of asthma attacks in ill children. Its higher concentration can also be helpful in sleep apnoea, ensuring better life quality. Yes, that hardly honorific title was awarded to none else but vitamin D. According to statistics, much more people have a deficiency than normal levels. With that in mind, blood 25(OH)D3 levels are worth controlling, and it is good to introduce supplementation adequate to test results. 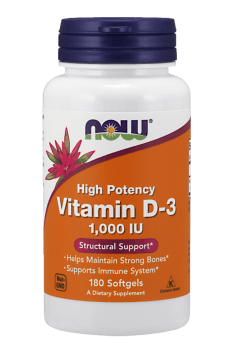 Now Foods Vitamin D-3 is recommended as a supplement for mild deficiencies of the vitamin as well as preventive healthcare. It can be used in order to improve overall health, especially in terms of the nervous, immune and skeletal systems. Supplementation is particularly recommended in spring and autumn. Improves memory and intellectual capacity; nourishes and regenerates brain cells.